In Application Manager, there is a SD Card column. Is that the external SD card? There are 14 apps on it and everyone says you can't put apps on the external SD card. Yes. As you found out, there are a lot of people spreading a lot of BS about the SD card not being usable with KitKat. 99% of what has been spread around about that is not true. And the other 1% can be worked around. Can you be a bit more specific. I went through the roof when I updated to KitKat & found that I could no longer use my backup utility to back files up to my SD card. One can no longer write to an SD card. I'm not rooted & never will be. If you have new information, I'd love to hear it. Your backup utility can be updated by it's developer to work with the SD card in KitKat. If they tell you otherwise, they are lying to you. I personally have used Helium to backup in KitKat. It's not true that you can not write to the SD card in KitKat. I write to it everyday and run many apps that write to it as well and I am not rooted. based on the reviews alone, I would not try it. The workaround requires root & I have no reason to believe that they are "lying" based on all of the articles that appeared immediately post-KK release. I too have heard bad things about Helium. It's not BS. Third party apps can't access the SD card without root and running the SD card fix app. OK, I'm not arguing, just trying to understand. I knew I'd read somewhere that you could put 3rd party apps on the SD card (UNrooted, as I am) but when I mentioned it here, everyone said no, you can't. Then when I'm in App Manager I see the SD Card column and there are several apps that were automatically transferred (via Google) from my Droid to the S5 listed in the SD Card column. Oook. What does it matter who does/allows it? The fact is, the 3rd party apps (appear) to be on the SD card. And I didn't request that they go to the SD card, it was done automatically by the Play Store. So, would this statement be fact... "On an unrooted Verizon phone with KK, you CAN put 3rd party apps on the SD card. I'm just telling you guys facts. You are welcome to not use your phones fully. It won't affect me. I am not rooted and have no problem writing to my SD card. Many third party apps have been updated by the developers to use and write to the SD card. Apps that don't work can be updated to work if the dev so chooses. You're only hurting yourselves by holding onto this myth of not being able to write to the SD card. I'm trying to do you a favor. Anytime you want you can start using your SD card instead of being unhappy and complaining about something that's not even true. I agree with the other user. 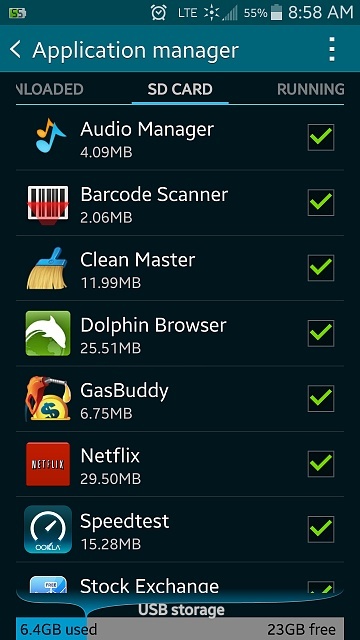 Please name examples of these 3rd party apps that you are using to write to your SD card on an un-rooted phone. In the interim, I'll look up a couple of the articles that say otherwise. I know for a fact that I can't write to mine. - Helium - if a backup app like this can work with SD card, there is NO excuse for any other saying it is not possible. Despite what was written here, the app does have good ratings. I don't care if anyone uses it and I have always said myself it can be buggy is some respects (nothing to do with SD card issue) but anyone's opinion of it doesn't matter as far as the fact of that it proves writing to the SD card by 3rd party apps in possible. - Kingsoft Office Beta 6 (this version not available publicly yet - I am a tester). - All of my games - moved every single one to SD card with no problem and they have all stored data there with no problem. - I have moved all of my videos, music, photos to the SD card with no problem and it can be accessed by the 3rd party players I use. I could go on, but I do have a job to get back to. You asked for examples and those are just some of them and is certainly enough to prove that writing to the SD card by 3rd party apps is more than possible. Devs of apps you use that are not currently compatible can be made compatible if the dev stops being lazy. Of course besides the 3rd party apps, there are as you know the built-in "first-party" apps you can use as well, and other Google owned apps like QuickOffice that work with SD card. All of these things make my SD card fully functional for me and I store, write, use, delete, create folders, files, data, etc on it all the time. Thanks for the effort. I'll test a couple. - Helium - if a backup app like this can work with SD card, there is NO excuse for any other saying it is not possible. I would not get too excited about the 3rd party apps that have been updated to "work" unrooted. They have admitted to be using a little known MEDIA SCANNER api that bypasses the new ext sdcard rules. First, there are problems and not all file types are supported. Second, if you go look at Google's rule wording they *very* plainly state that 3rd party apps will NOT be allowed to write but to their assigned folders on external cards. Do you really think they are going to sit still and allow that workaround to continue? It was an oversight nothing more. I would not be surprised to see it closed in the very next release of KK. Can someone explain to me why my above screen shot of 3rd party apps installed on the SD card is not validation that 3rd party apps CAN be installed on the SD card? On the flip side, I downloaded 3 apps from the Playstore this morning and none of them installed to the SD card or even let me choose to move them to the SD card. So I installed File Expert (jpr says it's fully functional with the SD card). It didn't download to the SD card but gives me the option to MOVE it there. When I opened it I got a message saying "oops, File Expert doesn't have access to your SD card files but we're working on it. Stay tuned". I uninstalled it because I didn't need it. Just wanted to see if it would install on my SD card. 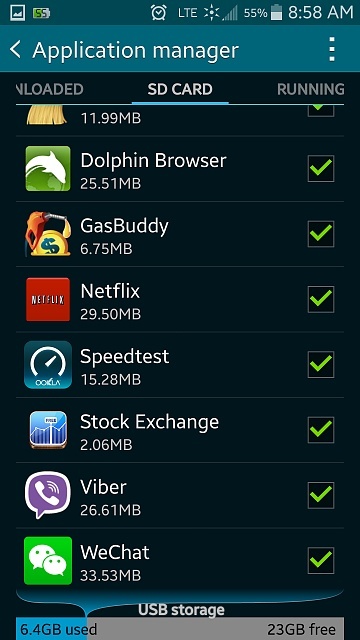 I had all these apps transfered to my SD card. They all are functioned normally. Am I missing something? Not really. You'll find that some apps can't be moved though. I thought it means that app is in the SD card. I don't have any apps that are in the SD card without the green check. My phone is not rooted by the way. I agree. But that's always been the case. Some apps just can't be moved to the SD card. 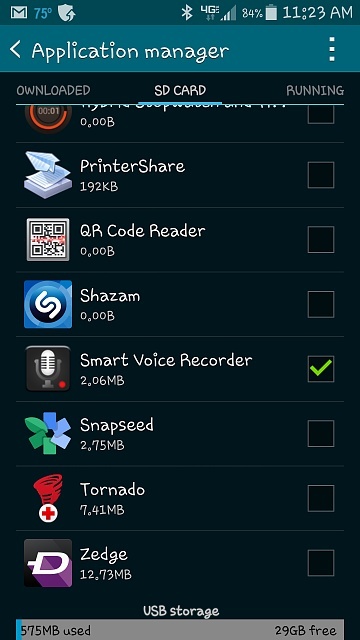 @monicakm did your SD card already have some apps in there before it was placed in your S5? If so, are those apps shown without the green check? No, this was a brand new Samsung card that I bought to go in the new phone. I've noticed that even tho the apps are located under the SD Card column in App Manager, if I tap on the app, I get the option to MOVE to the SD Card. So wonder why it's listed as being on the SD card if it's really not?? When I tap on the "Move to the SD Card", I then get the green check mark next to the app. If you're getting the check mark after tapping Move then the app should now be on the SD card. Try ES Explorer to double check. It's one of the best file manager apps available.